First Priority: Visit scary, mysterious places and TAKE PICTURES! Visit Roswell, New Mexico. Take pictures of the place where U.F.O. crashed. Get into Area 51, take pictures of aliens, U.F.O.s and so on. 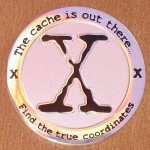 This beautiful coin is an hommage at the well known TV series “X-Files”, which objectives scary and mysterious topics. Following the slogans of Agent Fox Mulder (“The truth is out there” and “I want to believe”), this coin is labeled “The cache is out there” and “I want to find the cache”. 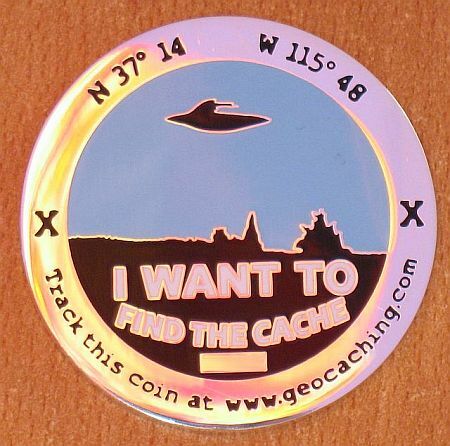 On its back side the coordinates of the “secret” military research facility “Area 51” are shown..
Dieser schöne Coin ist eine hommage an die bekannte Serie “Akte X”, die sich dem Grusel- und Mystery-Thema verschrieben hat. 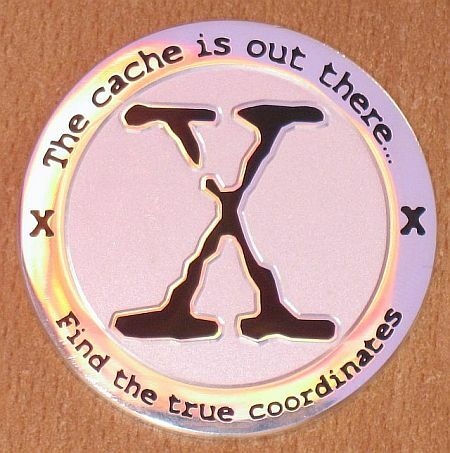 Den Slogans von Agent Mulder folgend (“The truth is out there” und “I want to believe”) trägt dieser Coin die Inschrift “The cache is out there” und “I want to find the cache”. Auf der Rückseite trägt er die Koordinaten der “geheimen” Militäranlage Area 51.